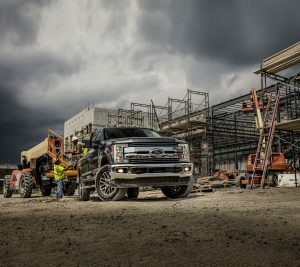 Many shoppers come to Fairley & Stevens unsure if they should get the 2019 Ford Super Duty F-350 XLT, 2019 Ford Super Duty F-350 Platinum, or the 2019 Ford Super Duty F-350 Limited. Now, these pickup trucks have many similarities, but there are enough differences you should know about. We’ll guide you through them, so you can make an informed decision. Keep our dealership in mind as you seek to find Ford F-350 trucks, because we have a wide selection to choose from. You get plenty of capability with the Ford F-350 XLT, Ford F-350 Platinum, or Ford F-350 Limited. However, there’s a key difference you need to know about. A 6.2-litre Flex Fuel V-8 engine can be hard on the XLT and Platinum models, but not the Limited. Standard on the Limited and available for the other two is a 6.7-litre Power Stroke V-8 turbo diesel engine. While the turbo diesel engine provides more torque, you can outfit the 6.2-litre engine to run on compressed natural gas or propane autogas. 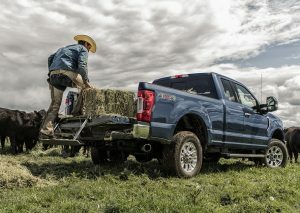 Trucks are all about getting a job done, and you certainly enjoy that with the Ford Super Duty line. While these three models come with utilitarian features, you’ll find some key differences. The Ford F-350 XLT can be outfitted with optional running boards. As for the other two models, they come with power deployable running boards standard. That’s a nice convenience for getting in and out of the cab, but the running boards stay safely tucked up as you drive, reducing the likelihood they’ll be damaged by obstacles. The XLT comes with Quad Dual beam halogen headlights, while the other two models use LED headlights which are more durable and provide more even illumination. Fog lamps come standard on the Platinum and Limited models but are optional on the XLT. They’re especially helpful in fog, snow, or heavy rain, helping you to see ahead more clearly. LED box lighting is standard on the Ford F-350 Platinum and Limited but is an optional feature for the XLT. Trailer tow mirrors come on all three models, something which helps tremendously for seeing properly while pulling a trailer, boat, etc. On the Platinum and Limited models these mirrors extend out with the press of a button. This option is available for the XLT, otherwise you need to manually extend the mirrors on both sides. Getting into and out of the box is simpler with the Tailgate Step and Tailgate Assist, which is a deployable handle. This feature comes standard on the Platinum and Limited, but it’s an option for the XLT. Some of the biggest differences emerge when you look at the interior of these three truck models. While the Ford F-350 XLT has air conditioning and manual temperature control, the other two feature dual-zone automatic temperature control. Another convenience, power-adjustable pedals with memory settings, is standard on the Platinum and Limited, but optional for the XLT. All three models come with black vinyl covering for the floor. The Platinum and Limited use a premium vinyl material. A leather-wrapped steering wheel and leather upholstery come on the Platinum and Limited but not the XLT. An 8-inch productivity screen is included on the Platinum and Limited models, versus a 4.2-inch screen in the XLT. See these differences today by visiting Fairley & Stevens. As you’re shopping for a Ford Mustang, you might be wondering if the 2019 Mustang GT premium or 2019 Mustang EcoBoost is better. We offer both at Fairley & Stevens and understand the differences. This comparison will help you assess which version of the car is best for your preferences and needs. We have a nice selection of either version of the Ford Mustang, so no matter what you pick we can help. For example, you can check out our select Mustang EcoBoost inventory right here on the website. While both versions of the Ford Mustang have been designed to thrill you, how they accomplish that goal differs greatly. 0 lb.-ft. of torque. Its design conserves fuel, making it perfect for anyone wanting to spend less at the pump and reduce pollution. With the Ford Mustang GT Premium, you benefit from the legendary 5.0-litre V-8. It puts 460 horsepower and 420 lb.-ft. of torque at your command. Needless to say, the result is incredible. With 0-60 mph acceleration time in under four seconds, you can get up to highway speeds in a hurry. To keep the 5.0-litre engine running smoothly, the Ford Mustang GT Premium features an engine oil cooler. The car also has selectable drive modes, something you don’t get with the Ford Mustang EcoBoost. Different settings change handling and response, so you get ideal performance for a situation. Both cars have a six-speed manual transmission, which helps you feel more connected to the machine. With the Ford Mustang GT Premium, the manual transmission also has rev matching for smoother transitions. A 10-speed automatic can be paired with either engine. While not many, there are a few key differences when it comes to safety equipment for these two versions of the Ford Mustang. Both have been designed to keep you safe in a crash and help you avoid dangers on the road. You can add a blind spot information system to the Ford Mustang GT Premium. The system warns if another car is out of sight in the next lane, while cross-traffic alert tells you if another car is approaching from either side while you’re reversing. LED fog lamps come standard on the Ford Mustang GT Premium, but not the EcoBoost. Another area where several differences emerge is the comforts and conveniences you get in the Ford Mustang GT Premium versus the Ford Mustang EcoBoost. While optional on the Ford Mustang EcoBoost, the Ford Mustang GT Premium comes with dual-zone automatic temperature control standard. 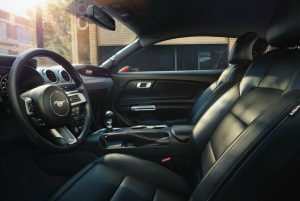 Some features only come on the Ford Mustang GT Premium, like ambient lighting with different colour settings, illuminated door-sill scuff plates, universal garage door opener, plus leather seats with heating and cooling for the front seats. 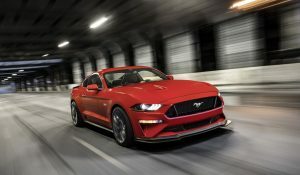 Now that you have a better understanding of how the 2019 Ford Mustang GT Premium and 2019 Ford Mustang EcoBoost differ, it’s time to decide. Contact us at Fairley & Stevens to arrange for a test drive and to see these cars in person. What Engine Features does the 2018 Ford EcoSport Have? Swing into the next big thing when you get behind the wheel of the all-new 2018 Ford EcoSport, a new SUV that is designed with endless possibilities at its core! This exceptional vehicle features two powerful engines and a list of exceptional performance systems! Continue reading to learn more about this exceptional vehicle and what features it has to offer!